The eternal quest for a truly usable two-person sleeping bag has finally concluded, and Kelty has taken the prize. The Tru.Comfort Doublewide sleeping bag solves the basic problem of how to make one bag work for two people. Kelty thought inside the bag on this slick 20 degree rated sack, giving each sleeper their own full-length comforter, attached on just the outside so you can roll up in it or fling it off as your internal thermostat dictates. The main cover on the outside of the bag covers both of you, but you can each zip down your side to vent or not, so you have the best of all worlds. You can even zip it all the way off and leave it behind if you're confident in the weather cooperating where you're heading. The Sheflogger and I agree on this one, the Kelty Tru.Comfort really is the cat's meow. We can each regulate our own temperature and airflow while still retaining maximum spooning availability. The hood is perfectly sized for two normal size pillows, the rectangular cut gives you the luxury of movement and Kelty's Cloudloft synthetic insulation is easily good for its 20 degree rating. The Tru.Comfort is a stout bag at 9.5lbs, and it doesn't pack down small, but what you get is a super-comfy bag that works across a very wide range of temperatures for two people - of virtually any size, thanks to the 6.5 foot length - who may not entirely agree the meaning of the words "cold" and "hot." Our trials and tribulations of zipping sleeping bags together are ended. The Kelty Tru.Comfort truly is the best of both worlds, and at a very reasonable price point to boot. Looking for a single pack to take you through multi-day hikes all year long? No surprise, Kelty has you covered. The Lakota 65 is a lightweight yet spacious pack that keeps you organized all season, every season. The Lakota's 65 liters of space are more than adequate even for winter weekends, and at just 3lb 12oz for the medium/large size your back will thank you. What's amazing are all the features they've managed to stuff in the Lakota: it's a top-loader with a separate sleeping bag compartment, floating top lid with two pockets, side access to the main cargo area, two mesh water bottle pockets, hydration sleeve, and a few small flat open pockets sewn inside the top of the main compartment. Compression straps out the wazoo keep your load tight, and the beefy padded hip belt rides comfortably with loads as heavy as you'll want to carry. Ice axe loop? Check. Load lifters? Check. Rain fly? Check - wait, what? Yeah, a built-in pull-out rain fly is tucked into its own little front pocket. Another unexpectedly nice touch is the grab handle built into the daisy chain on the front, which is a very useful means to move the pack when its lying on its back and is in addition to the normal handle on top. The Lakota 65 is an exceptionally well thought-out design with extensive features at a very reasonable, even light weight. Kelty manages to keep it all streamlined and working well together, and does it without breaking your back or your bank account. Nicely done. Kelty has a thing for pets and kids, but at least they don't try to carry cats around in Baby Bjorns. They keep them separate, like chocolate and peanut butter in their natural states. For the kid who needs a fully pimped ride comes the Kelty FC 3.0 child carrier, a giant step forward from the days when my folks threw me loose in a Radio Flyer wagon to bounce my skeevy little head off the metal rail on the smallest bumps. The Kelty FC 3.0 is truly cush for both baby and parent. A five-point harness in a fully padded cockpit for the LittleFlogger accomodates any rugrat+gear up to 50 pounds (that's Denali quality training right there) and features a complete array of adjustments from height to legs. The parent gets equal treatment with a suspension worthy of an expedition backpack, including a fully padded hip belt connected to a beefy aluminum frame with an auto-deploying kickstand and no-pinch hinges. Dry weight is a manageable 7.5 pounds. You can dial in the fit with a sternum strap, torso length adjustment and even load lifters to save your lower back from oblivion after seven hours on the trail, whether it's in Appalachia or Disney World. A rain/sun hood is included, as is a nicely designed folding changing pad with - get this - actual padding so it's usable on a rough surface. Three full-size zippered compartments behind the kiddo let you organize a bunch o' stuff, plus there's a separate little toy garage down low. Getting your little ingrate in and out is much easier than with other carriers we've used, just two buckles for the shoulder straps and a couple quick tugs to snug it up. Once s/he is on board, the Kelty FC 3.0 carries like a dream. We loaded up a highly active and freakishly strong three-year old for a three-mile jaunt up a muddy trail, and we were nervous about the inevitable bucking about as she tried to grab every single branch and leaf she saw. Imagine our surprise - and relief- when it turned out very little torque passed through the suspension. The only surprise was when when she started imitating my air-blow nose clearing technique on the back of my head, but that was my bad for doing it right in front of her. Overall the FC 3.0 is the best child carrier we've used to date. Looking for something short of a pack but still able to hang at the crag? Look no further, boulder-boy-ee. Assuming you're man enough to crush the inevitable metrosexual jokes with your own scathing repartee, the Kelty Rove messenger bag makes a great sidekick. Start your verbal smackdown by establishing your greener-than-thou credentials: the Rove is made from 60% recycled polyester fabric and vegetable tanned leather. Take that, oil-based monster synthetic pack guy. The interior is big enough for shoes, chalk bag, clothing and some munchies. Or if you're into that whole "education" or "work" thing (loser! ), a medium-sized laptop and legal pad. The interior is safety-orange, so you'll have no problem finding your crap - I mean, valuable stuff. It's got a slick easy-clean lining, a single divider, and two small slit-style pockets under the flap each big enough for a cell phone, energy bar or even a bottle of beer. The wide adjustable shoulder strap is plenty comfy. The Rove even comes with one of those recycled shopping totes that you're embarrased to be seen shopping without these days. Fair warning: it's stylish enough the SheFlogger will try to steal it, so keep one eye peeled. W.C. Fields famously said, "I never drink water because of the disgusting things fish do in it." Of course, his liver was the size of his thorax and a vibrant shade of blue, but you have to admire the man's commitment. For us less-committed but probably healthier people, getting a bunch of water down our pieholes when we're engaged in high-perspiration activities is a priority. Kelty is here to help: their Aqua Porter is a portable canteen that fills the niche between Camelbaks and Lister bags. The 8.5L Nalgene is handy for car and basecamp, but it's packable too if you're going somewhere a filter won't work. A little metric reminder: 1L of water weighs 1Kg or 2.2lb, so you're looking at 8.5*2.2=18.7lb plus one for the carrier, about 20lb packed. The carrier is solidly built a la all Kelty gear, and the twist faucet never leaked on us. The handles are beefy and there are d-rings for a (not included) shoulder strap. The zipper slash pocket has a cord that can go through a roll of paper towels if you want to set it up as a wash station. All in all it's a great size for weekend warriors or a day at the crags in the hot season. The alternative is one of those monster square things, which are cheaper but a lot more difficult to move around. Ever pull into a campground and wish you could just attach something to your car and sleep under it? Kelty heard your wish and grants you the Carport Deluxe. Before you ask, there is no non-deluxe version for you cheapskates, although there is a simpler Car Tarp. The weatherproof Carport is a behemoth at well over ten pounds. On the plus side it's sturdy and the sleeve-and-clip design sets up fairly fast; we followed the clear instructions and had it up in about fifteen minutes first time. If there's wind you'll want to take the time to guy it out with the included stakes. There are two main configurations, as a lean-to or as an awning (pictured). Either way requires a roof rack, to which the Carport attaches with velcro tabs. In either configuration there is a lot of space: the large (for trucks and SUVs) has a spacious 126"x116" footprint, enough for four adults to sleep comfortably. In lean-to mode the triangular side panels drop down to provide a completely enclosed area, and there's a mesh window with privacy panel. For families and dirtbag climbers - you know who you are, you camp out in front of the good climbs at J-tree for ten days at a time - the Carport's versatility and roominess will be attractive. If you've got LittleFloggers, they can sleep in the car with the windows down and it's like a separate room, kind of nice for semi-privacy. George Carlin jokes about a place for your stuff. He must work at Kelty. Kelty makes stuff to hold stuff, cover stuff and carry stuff. 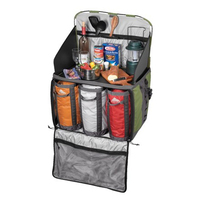 They make a lot of stuff including a really nice Basecamp series of stuff to organize your stuff. OK, I'll stuff it. If you're feeding larger groups of climbers or other poo-slinging primates you know how much space all that food and cookware takes up. Enter the Binto Bar: it stores, organizes and transports large quantities of kitchen items with ease. The basic format is elegantly simple: a fabric box with a skeleton frame holds three zip-top 16/8.5/14.5" HWD Binto bags, which come in basic, padded and insulated cooler varieties. The front zips open and folds down to reveal a large mesh storage pouch and the three Bintos slide out smoothly like drawers by pulling on their side handles. The velcroed top and side panels flip up and out to form an effective windscreen protecting a work surface with a stiff plastic top. There are three zippered pouches on the inside of the top panel for utensils etc. This is a lot of clever storage in a small space, and you can move it around easily by grabbing the side handles or using the shoulder strap. It even folds flat for storage, and the side daisy chains let you secure it for transport. I've seen other attempts at camp kitchens that create more problems than they solve, but Kelty's Binto Bar is a standout for its simplicity and utility.